Energy consumption during manufacture can give an approximate indication of the environmental impact of the material, and for most building materials, the major environmental impacts occur during the initial processes. The total amount of embodied energy may account for 20% of the building’s energy use, so reducing embodied energy can significantly reduce the overall environmental impact of the building. Embodied energy must be considered over the lifespan of a building, and in many situations, a higher embodied energy building material or system may be justified because it reduces the operating energy requirements of the building. For example, a durable material with a long lifespan such as aluminium may be the appropriate material selection despite its high embodied energy. As the energy efficiency of a building increases, reducing the energy consumption, the embodied energy of the building materials will also become increasingly important. 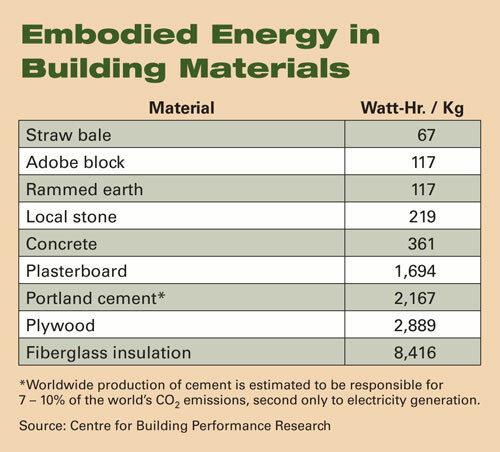 How is embodied energy measured? Embodied energy is measured as the quantity of non-renewable energy per unit of building material, component or system. It is expressed in megajoules (MJ) or gigajoules (GJ) per unit weight (kg or tonne) or area (m2) but the process of calculating embodied energy is complex and involves numerous sources of data. Buildings should be designed and materials selected to balance embodied energy with factors such as climate, availability of materials and transport costs. Lightweight building materials often have lower embodied energy than heavyweight materials, but in some situations, lightweight construction may result in higher energy use. For example, where heating or cooling requirements are high, this may raise the overall energy use of the building. • the durability of building materials. • how easily materials can be separated. • use of locally sourced materials. • use of recycled materials. • specifying standard sizes of materials. • selecting materials that are manufactured using renewable energy sources.